There are so many wonderful animals living in shelters, ready to give unconditional love to someone willing to share his or her home, but many will never have that opportunity. Buttercup was one of the lucky ones. Rescued from a shelter by a caring couple, she went on to spend the bulk of her life with one very fortunate human, providing invaluable companionship while developing a bond that was arguably stronger than that in most human relationships. Buttercup was the queen of her house, ruling with an iron paw but a heart of gold. She spent the bulk of her life with two other cats and one very fortunate human, providing invaluable companionship while developing a bond that was arguably stronger than that in most human relationships. 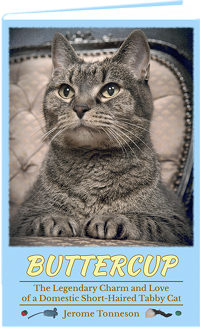 Buttercup is the true story of a simple but beautiful house cat. It is an account of her loving nature, her unique quirks, her confidence, her intelligence, and the unbelievable things she did during her life: from helping raise two adolescent cats that weren't her kittens, to protecting the house from intruders (four- and six-legged), to reminding her human that sometimes he simply needed to stop and pet the cat. In short, it is the story of all of the great things that made Buttercup uniquely Buttercup. Many photos were taking of Buttercup, but for the longest time there were no known videos. That changed when a video was discovered on an old CD-ROM backup. It is the only known video of Buttercup. More Buttercup stories appear in the article Communicating with Cats in the October 2013 issue of MetroPet Magazine. Jerome's latest project is Segmeowtation Fault, a webcomic of technical musings and cats. Even when a comic isn't directly feline-related, it will contain a cat reference or drawing. Most of the cat drawings are based on Buttercup and her feline friends. A new comic is posted every Wednesday evening.